I have several friends who have July birthdays, so one of them will be receiving this card! Thanks for popping in, and I hope you'll play along with our sketch! You can see all the details at the TSOT blog, or you can submit your creation on our Facebook page as well! 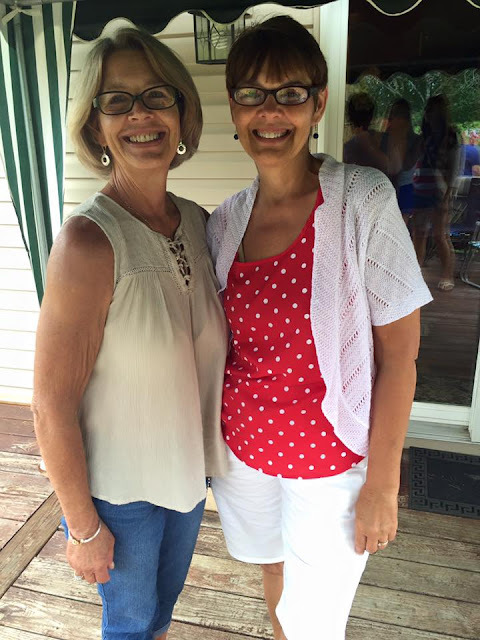 Here's a photo of me with my younger sister Joyce at my nephew's annual Fourth of July party! It was a little damp but we had a great time! Great card. Beautiful picture. I have two sisters and I'm in the middle. We had a great July 2nd family wedding. Great memories. Great photo of you two lovely sisters. LeAnne I love this! Just gorgeous! Gorgeous LeAnne - I love the ombré effect on the paper, so subtle yet effective. Wonderful collage effect too - I'm taking notes!